Here at Cultivate we believe in a long-term, cyclical marketing strategy based on the idea that building real relationships with your customers is the best way to nab new business and build brand reach. Your website is the hub of your marketing strategy, so it needs to be user-friendly and easy for search engines to find. Add in the content your customers want when they want it, then engage, engage, engage. Hey, remember how that Pets.com Super Bowl ad worked out? Super Bowl ads are the MOTHER of all scatter-shot marketing. Spend a 4.5 million bucks to advertise to a giant audience…then go out of business in a year. Well done. Mass marketing is becoming a thing of the past. When you choose a leaner, more targeted approach, you speak directly to your potential customers and your base...and no one else. You can't engage your customer until you answer these questions: Who are they? What do they want? Where do they hang out online? How can you deliver? There are a ton of benefits to targeted marketing. Your emails are less likely to be ignored (or worse, marked as spam), you'll only have to respond to potential and actual customers, and you'll save money over expensive ads that reach tons of people who will never, ever buy from you. Let's contrast that Pets.com fail with the Dollar Shave Club viral ads win. This startup company spent a paltry $4,500 on very funny ads and attracted 4.75 million views in 2012. In the first 48 hours after the first ad debuted, 12,000 people signed up. The ads are hip, funny and brash—just the formula to appeal to young men. Of course, we can't overlook the economical price, either. The markup on retail razors must be astronomical. Bottom line: Great business model. Great marketing strategy. Great value. Boom. 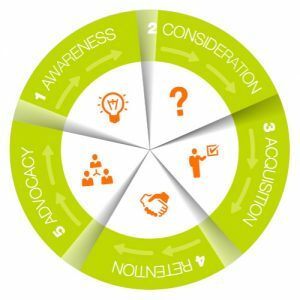 At every stage of the Growth Cycle Marketing process, accessibility and customization are critical. Give your visitors what they want, when they want it and your conversion rate will go up every time. Your content must be easy to find and easy to navigate. Start with your web design. Be sure your website is responsive so it’s always accessible on any-sized device. Your website shouldn’t be a game (forcing your visitors to play ‘find the hidden gems’) or a maze (compelling your visitors to scroll all over a page too wide for their mobile device). Ain’t nobody got time for that. … and don’t overlook the importance of optimizing your content for search engines. Your content must be customized. Give your people what they want. Know what your customers are searching for and don’t hesitate to dish it out solutions on a regular basis. That means fresh, updated content, plenty of information and lots of opportunities to interact. Answer concerns and questions immediately. People are impatient, and if you don't answer them, your competitors will. Customer conversion and retention depends on fast response. Attract and retain new customers and expand your brand reach at every stage in the buy cycle. 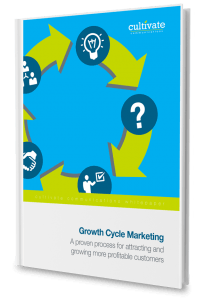 Learn all about Growth Cycle Marketing when you download our FREE white paper. Fresh content is essential. There's no size limit on your website, so why limit yourself? You don't want customers to visit once, you want them to come back again and again. New content gives your current and potential customers a reason to revisit, plus new stuff to share. Blogging is one of the most common ways to regularly add fresh content, but don't forget: informative articles and white papers, graphics, videos, and even sales copy can also be great forms of engaging content. One thing we know for sure: web users love to engage, especially when the content is FUN! They eat up contests, quizzes, memes, featured photos and videos. Lay’s chips took user interaction to the next level in 2013 and 2014 with contests to design new chip flavors, which resulted in such flavors as Cheddar Bacon Mac & Cheese (yummy!) and Mango Salsa (not yummy!). Nearly 4 million people from 14 countries submitted flavors. Most companies don't have that kind of “holy grail” reach, but the important thing is to share content your customers will want to pass on, and that means getting them excited, amused, or intrigued. When you set the hook with social media, be prepared to reel them in with your landing page. Your links should lead to the content promised. Don’t lead them astray when they’re so close! (So don’t link to a general page where they have to search around forever, or to a page crowded with other offers, CTAs and links.) Keep it simple. The Lay’s page mentioned above is a great example. At this stage of the contest, you can vote for your favorite, learn more about the contestants and the flavors, share the page—and not much else. When people give you their precious personal data, they expect a response. A 2011 study by Harvard Business Review revealed that companies that respond within an hour are 7 times more likely to engage the customer in a meaningful conversation and 60 times more likely to engage than companies who respond a day or more later. You can’t ignore that data, folks. Be sure your team has a process in place to handle email and website inquiries in a timely manner. An automated response lets customers know you're interested, then quickly following that with a personalized response starts the conversation...and potentially the conversion. Start growing your business today! Download our FREE Growth Cycle Marketing whitepaper. It's a free resource designed to help you take positive action to increase your reach, sales and retention.